The Yacón is a perennial plant grown in the Andes of Perú for its crisp, sweet-tasting tubers. The texture and flavour are very similar to jicama mainly differing in that yacon has some slightly sweet resinous and floral (similar to violet) undertones to its flavor. This flavoring is probably due to a sweet substance called inulin, as replicates the sweet taste found in the roots of elecampane, which also contains this substance. Another name for the yacón is Peruvian ground apple. The tuber is composed mostly of water and fructo-oligosaccharides. Commonly called "jicama" in Ecuador, yacón is sometimes confused with this unrelated plant. Yacón is actually a close relative of the sunflower and Jerusalem artichoke. 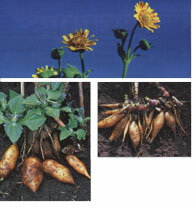 The plants produce propagation roots and storage tubers. Propagation roots grow just under the soil surface and produce new growing points that will become next year's aerial parts. These roots resemble Jerusalem artichokes. Storage tubers are large and edible. These edible tubers contain inulin, an indigestible sugar, which means that although they have a sweet flavor, the tubers contain fewer calories than would be expected. Yacón plants can grow to over 2 meters in height and produce small, yellow inconspicuous flowers at the end of the growing season. Unlike many other root vegetables domesticated by the Indigenous Peoples of the Andes (olluco, oca), the yacón is not photoperiod sensitive, and can produce a commercial yield in the tropics. Yacón provides for two nutritional products: the yacón syrup and yacón tea. Both products are popular among diabetic people and dieters because the sugar these products contain is not absorbed by humans. This form of sugar, known as FOS (fructooligosaccharide), a special type of fructose, leaves the body undigested. The syrup is also a prebiotic which means that it feeds the friendly bacteria in the colon that boost the immune system and help digestion. The tubers can be eaten raw as a refreshing treat on their own, finely sliced and mixed into salads,boiled or baked, fried as chips or prepared as a pickle. There is also commerical interest as a flavouring for yoghurt. They are sweet, juicy and almost calorie free. The main stem can also be used like celery. The texture and flavour have been described as a cross between a fresh apple and watermelon. The plants are vigorous, herbaceous, perennial and extremely hardy tolerating hot summers, drought and poor soils. The foliage of the plant dies back in the winter after flowering at which time the tubers are harvested carefully to avoid damage to the tubers. They tend to continue sweetening if left in a cool dry and dark place for a week or two before consumption. The offsets are then replanted for the next season. Below - some home grown crop from one plant. Below - Second plant - tubers not as good quality. Below 09/06/11 Third plant - good lot of tubers and replantable material. The white one has been scrubbed clean under the tap - very easy process. Getting to like them more - they definately are a good snack food. Shared a large one last night with my African students and the whole thing got eaten (they all thought it was a sweet potato and were surprised we would eat it raw). The big one was nicer (sweeter) than the little one I ate earlier. Added some cubes of Yacon to a chicken casserole a couple of nights back and it was really good - one of those sweet veg that go so well with chicken. Did give me quite a lot of wind though lol. Must be due to that indigestable sugar that they mention. Ate the rest for lunch yesterday......so expecting some wind today lol - lucky students! Roasted some the other night - this is where they shine! Very nice - Andrew (son) agreed. Stored some tubers in the pantry for a few weeks - ends had softened slightly but sweetness had increased. Added slices to a Thai prawn stir fry and it was absolutely delicious. Kept it's crunchy texture nicely - also added Michelle's water chestnuts :) so the stir fry had lots of textures going on - best I've made and enjoyed. Still lots to harvest in the garden! I hope they keep ok in the ground for a bit as there is more than I can use quickly. 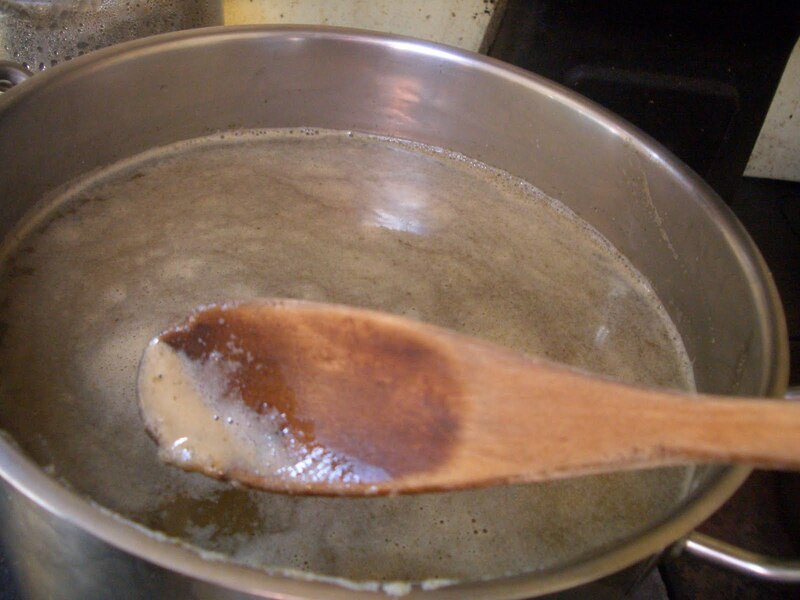 “Yacon syrup is a sugar substitute native to the Andean region of South America. It is glucose-free, and does not increase blood sugar levels. Because of this, yacon syrup is often recommended as a sweetener to those suffering from diabetes or at risk of becoming diabetic. The syrup is derived from the roots of the yacon plant, and according to some studies is a good source of antioxidants. The yacon plant tastes similar to jicama, but is biologically closer to the sunflower family. The component that gives the roots a sweet taste is Fructooligosaccharide, or FOS. The tuberous roots may be made of nearly 50% FOS, and are believed to be the greatest producers of the saccharide in the natural world. We had an over-abundant supply of yacon that had to be harvested. Yacon (also known as ground apple) grows very easy in our (sub-tropical) climate, one plant produces many rizomes for division and re-planting. It needs very little attention when in the ground and Tom is of the opinion that it improves the soil where it has grown. 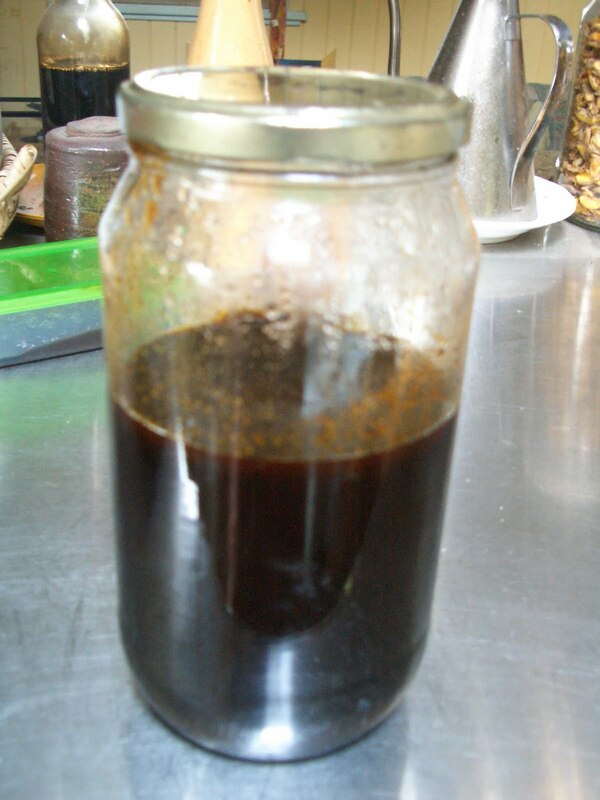 One can only eat so much yacon and we do not like wasting resources, and after visiting a health shop and noticing the latest health craze is yacon syrup, I decided to try and make some. I researched a bit on the internet and found that yacon syrup is a healthy sweetener, just what the doctor ordered for us. So if I could get this yacon syrup to work, it would mean we would no longer need to buy any sweeteners, be one step closer to self reliance and receive health benefits. So I started by digging up a patch of yacon and washing it. To wash it, I put it in a crate and set the hose on it with a fair bit of pressure. I ended up with about 2/3 of a crate of yacon. I peeled 2 big bowls full of yacon with a potato peeler (about 2/3 of the amount I had). Then I juiced the peeled yacon and poured the juice into a big pot (around 4 1/2 Litres of juice). The pulp ended up with the chickens and the geese. The pot is on the stove and as you can see some scum is already floating on the top. I kept skimming the scum off the top and once it started to reduce I skimmed it from the sides of the pot as well. I brought the pot to the boil and then let it simmer. I started in the afternoon and let it sit on our wood stove overnight. In the morning I brought it to the boil again and skimmed off more scum from the sides and top. By this time the juice had reduced to about 800ml. The juice had become very dark and the smell was a delicious molasses or treacle smell. I took the pot off the stove and filtered the juice through a fine metal mesh. Any thicker material staying behind I put in a separate container (for use as well, just to experiment with it. It can be added to dishes that require cooking as a sweetener). Finally I ended up with a jar with 750ml of yacon syrup. It has a beautiful, sweet treacle like flavour. I keep it in the fridge, but I don’t think you need to. We add it to drinks, desserts and just use it as a general sweetener. This abundant resource in our garden is allowing us to enjoy healthy sweets and we no longer need to buy other sweeteners. As a comparison, the jar of yacon syrup in the health shop was around 200ml for $24… And it was most likely imported from South America. Tom is now looking at possible other uses for this resource, eg adding it to animal fodder or making it into a fuel, if he can get to it before I do. This years Yakon crops have been dreadful compared with last years. Personally, I don't play around with my plants too much. I just let them do their thing the way nature intended. You will need do do some trials (some with flowers some without) to come to some conclusion about your flower theory. You might find something on the net if you're lucky. Re the dividing of the rhizomes - I will be honest, I have no idea. I don't get too technical about these things. I just replant what looks to be a good viable chunk in each hole. Keep a record of your experiments with growing and give us all some feedback. I have noticed the red rhizomes have several shoots. To replant, should I sub-divide the red rhizomes and allow only one shoot per plant. I wonder if removing the yacon flowers would encourage tuber development. It would be good in juice Rob, for sure. The first year we all ate it raw as it's so nice and crunchy; good in stir fries etc. I will not give up trying to grow it successfully and have replanted the bit of growing material I ended up with this year. I've never given any of my plantings much attention and after the first years giant crops decided, perhaps wrongly, that it thrives on neglect. Perhaps I need to pamper it along a bit more. I do move them to a different location, that's the sad part. The first year I had so much crop I didn't know what to do with it all, the second not nearly so good, the third dreadful. Reusing my own planting material? - possible I suppose, though I don't know why that would be a problem. Seasonal differences each year? - could quite possibly be an issue, maybe not enough water this year. Lissa, when replanting, would it help if you move the yacon to a different location every year? I started with a branch from Northey St, only got a small eating tuber about the size of an apple but many fat healthy looking red rhizomes. I grow yacon as they would be great in stir frys and Chinese dumplings. That's very interesting Lissa. I had a fabulous first year with these and then my housemate moved out and took his juicer with him. I only really enjoyed it as a juice extender, so when I neglected it the next year and it died before Christmas, I wasn't bothered. I find it really incredible in juice, as when you juice it alone it doesn't taste like much of anything, but in just about any combination it enhances the flavour of whatever it's with. I had a very poor harvest this year. Miserable in fact. It's getting worse from year to year. Plant growing material with shoots facing upwards. I would personally replant the rhizomes immediately. I don't find holding this material over for months does it any good. But that is up to you and others might have different experiences. Perhaps try planting them in pots first so you can control and keep track of them a bit better, then plant out in the garden later. I have harvested my yacon and want to replant the red propagating rhizomes for next season. is early Aug ok for planting in Brisbane? should be pointy end of the red rhizome go up or down? Mine were dreadful this year Darren, didn't even do as well as yourself. I asked the members of the ROGI FB group this same question and one person answered that she had good crops. So...go figure. Some people are having more success growing them in pots. The Jicama have done well enough from the three plants that survived. I like this a little more than Yacon anyway. Hi all just wondering how everyone else did with their yacon harvests mine were poor only 2kgs from 6 plants. Much better harvests from my jerusalem arts still harvesting just left them in the ground and taken what Ineed they didnt even rot.